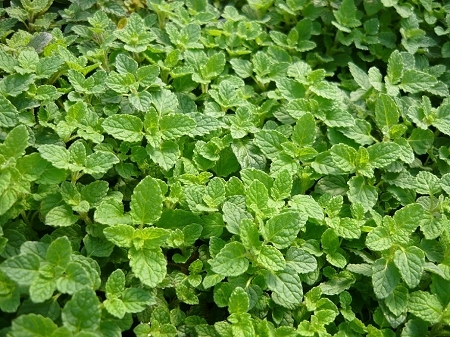 Strawberry Mint (mentha spicata 'strawberry')- The petite green leaves of this compact mint variety have a wonderful fruity scent and flavor. Size makes this mint variety well suited for containers and hanging baskets. A favorite for it's fruity scent and flavor. Easy to grow perennial in zones 4-9. Live plant in 3 inch container. I've had this plant for about a month now. It's definitely growing, though the leaves stay very small. The leaves do smell of strawberry, but it doesn't much taste like it. Great quality plant, but if you are looking for the hybrid mint/berry flavor, you're better off using spearmint & real berries. I don't usually fall for strawberry flavors, but this one is so delicate, I like it better than my former favorites -- pineapple mint and fruit mint. I've grown many others and I get them all from Colonial Creek. A nice smelling mint that smells very strong of artificial strawberry smell. Grows good and flowers great.